Reviewing Authority's Recommendations: 1. Prosecution establishes that accused was "the central figure in the indiscriminate beating, clubbing, burning and other mistreatment and torture of numerous Allied prisoners of war without cause or trial" through direct supervision and/or direct involvement. 2. 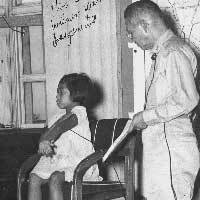 Accused did have control over camp guards, as refuted by testimony of three Japanese members of the camp staff. 3. "Commission's "conclusion of guilt was amply warranted by convincing prosecution evidence depicting accused as a "sadistic type" who brutally tortured prisoners at the slightest whim." James A. Byrum, 1st Lieutenant, Assistant Staff Judge Advocate 1. Accused ordered, directed and supervised subordinates in the beating, clubbing and other mistreatment of numerous Allied prisoners of war and personally beat and tortured others. 1. Accused exercised command only over office personnel at Kamioka and had no control over camp guards. 2. Accused denied knowledge or stated that he had merely heard of most specifications. 3. Accused testified that he did burn on eindividual for stealing food on one occasion but denied having done so on other occasions. 4. Stated that he treated prisoners well - bringing fruit and dried fish from his own home for POWs. In regards to the sentencing issue brought up by defense counsel: "Counsel for the accused have presented a brief comparing the instant sentence unfavorable with these in similar cases. Because of the varied character of the acts of which war rimes accused have been convicted, no general yardstick for sentences can properly be established. The fact that a commission in a certain case or cases may award an inadequate punishment, does not justify the reviewing authority in reducing proper sentence in other cases to that low level. The measure must still be the reasonableness and justness of the sentence as gauged by the punishment whihc the facts in each particular case demand..."